A lot of performance and a great spec for the price - equivalent to £275 per month. 1st monthly installment - £2400 (can be lowered). 23 monthly payments of £175.44. Total payable over term £6615.12. WhatCar estimates car to be worth £19.3k after 24 months and 20,000 miles on the clock - you do the maths. I would.... if I could afford it!! Need diesel for work or I'd be all over this. I assume it's 10k miles per annum? Need diesel for work or I'd be all over this. I assume it's 10k miles per … Need diesel for work or I'd be all over this. I assume it's 10k miles per annum? It's actually £250 cheaper with CVL - but they're a banned merchant on HUKD. Monday it will probably be even cheaper once the other brokers know it was a offer launched today! Hot! I'd try discussing with a VW dealer first to see if they can match the pricing of these online leasing brokers. I ordered a Tiguan recently and they restructured the payment profile so it was £0 initial and you also avoid paying the administration fee (i.e. brokers profit). It's actually £250 cheaper with CVL - but they're a banned merchant on … It's actually £250 cheaper with CVL - but they're a banned merchant on HUKD. Not sure why CVL are banned on HUKD, but they're reputable. I got my Golf R through them. I personally can't stand any VW Group cars, but have to say this is a decent deal and bargain way to get that kind of performance. Oh and before you all get your hopes up these prices are for flat paint which there aren't any. The cheapest option to go for will be white but at an extra cost. Cars have to be registered by end of September to also get the offer so you can't even factory order to get that price. Perhaps that's why those brokers get banned! Not bad, prefer the golf r though. Oh and before you all get your hopes up these prices are for flat paint … Oh and before you all get your hopes up these prices are for flat paint which there aren't any. The cheapest option to go for will be white but at an extra cost. Cars have to be registered by end of September to also get the offer so you can't even factory order to get that price. Perhaps that's why those brokers get banned! Its only on 250 stock cars of which none are in Urano Grey. Hence the cheapest colour to go for will be white at an extra cost. Its only on 250 stock cars of which none are in Urano Grey. Hence the … Its only on 250 stock cars of which none are in Urano Grey. Hence the cheapest colour to go for will be white at an extra cost. Ah right. I'd go for white then. I've always written the title in that format and not had any problems. Total cost is in the title, more information in the OP and even more information when you click on the get deal link - all the information is there. When I buy a holiday, I usually pay an initial deposit, that I don't get back. A deposit can be either returnable - or not, either way its still a deposit. A sum payable as a first instalment on the purchase of something or as a … A sum payable as a first instalment on the purchase of something or as a pledge for a contract, the balance being payable later. I paid a depost on our house and mortgaged the rest. Will i get that back? OK I've had a few beers and am on a train home killing time. But you aren't buying the car and it's not a payment against a future contract, it's the payment to start a contract. I was being pedantic and fellow pedants with a different view bit hard. Meeting friends in the pub when I get off the train, feel free to have a pint with me in spirit if not in body! I paid a depost on our house and mortgaged the rest. Will i get that … I paid a depost on our house and mortgaged the rest. Will i get that back? Yes if you don't burn it down without insurance. Main differences being that the Golf has 4WD, 20bhp more and extra doors. But the Scirocco has heated leather seats, bigger alloys and DCC - these added options would be an extra £3.5k on the Golf alone. Personally, the Scirocco gets my vote. No denying though that the Golf was a great deal. Oh, oh...look at this...a spare key for a Volkswagen Scirocco...they don't even make those any more! They don't even make that car anymore!! Is the insurance more or less on lease car when compared to a privately owned car? Thanks. Main differences being that the Golf has 4WD, 20bhp more and extra doors. … Main differences being that the Golf has 4WD, 20bhp more and extra doors. 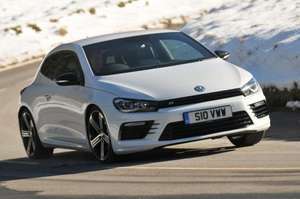 But the Scirocco has heated leather seats, bigger alloys and DCC - these added options would be an extra £3.5k on the Golf alone.Personally, the Scirocco gets my vote. No denying though that the Golf was a great deal. That and the fact that the scirocco is based on the mk5 golf and passat whereas the golf is mk7 and a much better car. Having said that, this is a cracking deal. Personally I would reduce the deposit and go for larger monthly payments. This reduces the financial risk if the car is stolen early on in the lease. What happens after the 2 years?